You love Texas – you’ve been here for about a year and the weather is one of the things you enjoy most. The warm climate and sunny days are definitely a perk compared to your snowy hometown and you’re excited that Summer is right around the corner. As you look forward to the barbecues, bonfires, and pool parties, you can’t help but smile – and when you do, your confidence drops because your teeth are dim and dull. You’re ready to make your pearly whites bright, and teeth whitening from Dr. Richard Fossum can give you the vibrant, sparkling smile you deserve. Learn more about how you can lighten your teeth for Summer from your trusted cosmetic dentist in Temple. What Teeth Whitening Options Do You Provide? Dr. Richard Fossum and Dr. Brooke Elmore help patients achieve the dramatic results they deserve with a few different treatment options. With decades of combined experience, our dentists can help you lighten your teeth several shades in as short as an hour. With this in-office treatment, you’ll find ZOOM! teeth whitening in Temple to be superior to other options for convenience and affordability. Our dentists will apply a lightening agent to your teeth. This gel is activated by a special lamp and you just sit back and relax while the gel eliminates stains and brightens your teeth. In about an hour, your teeth will be noticeably whiter – and since the treatment is so quick, this is a great add-on to a routine dental visit. To maintain your results at home, we’ll provide you with a custom at-home whitening kit. With this convenient method, you can whiten your teeth from the comfort of your own home. Our professional strength products give you results you just can’t obtain with over-the-counter strips and trays, and our kits are safer than anything you can find at a drugstore. In just 1-2 weeks of wearing your trays for a short amount of time each day, you’ll see a marked improvement in the color of your teeth. If you have complex staining from medications or medical conditions, porcelain veneers and Lumineers may be a great option to lighten your teeth. These thin, yet durable shells of porcelain will be permanently bonded to your original teeth after they’re prepared. You get to pick the shade of porcelain and the bonding agent, so your teeth can be as bright as you’d like. Or, if you’d like a temporary, but significant smile makeover, Lumineers are an excellent choice. These veneers are as thin as a contact lens and don’t require your original teeth to have enamel removed, so you can always undo this option. So, what are you waiting for? 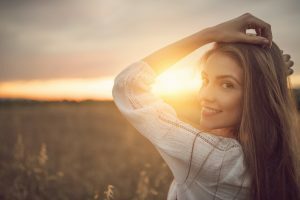 Summer is just around the corner and now’s the time to schedule your appointment with Dr. Richard Fossum to make your teeth as bright as the Texas sun!